“(5S)… describes how to organize a work space for efficiency and effectiveness by identifying and storing the items used, maintaining the area and items, and sustaining the new order”. How about some more detail? Sort – this is about getting your house in order. Sort out the mess and identify what you need to do your job effectively. Separate out what needs to be close to you because you use it often to what you need infrequently, which can be stored away from your direct work area. Get rid of what you don’t need. This introduces efficiency by ensuring you have quick access to what you need and that peripheral items (i.e. what you don’t need, or need less often) don’t muddy the waters by getting in-between you and what you need to do your job right now. Set – this is about systematizing what you need to do your job. Get things into a logical and established order – so that what you use frequently is close to you, you know where everything is and you know how to get to it quickly. Shine – shine has us cleaning our workspace and ensuring everything is neat, tidy and effective. At a deeper level, Shine is about maintaining our equipment, keeping everything clean and serviced – ensuring that everything works when we need it to. Standardise – this is about establishing the standard for ongoing organisation expectations. The standard will set according to what is required to support effective working. So, perhaps you’ll define what the optimal requirement for frequency of cleaning is, or the required standard for equipment storage etc. Sustain – once you’ve established the optimal organisation for working, you need to ensure you don’t drift or slide. Put into place & follow a programme for monitoring that the new established standard is adhered to. Include such things as frequency, person responsible etc for additional assurance. As 5S principles are visual (it won’t be too difficult to notice that massive spill of coffee all over your paperwork, which is stacked over your keyboard! ), it should be clear to see whether the standard is being sustained. However, you can also consider introducing checklists to ensure that less visible standards (e.g. calibrating equipment under shine) are being met. Okay, so how does this help me? 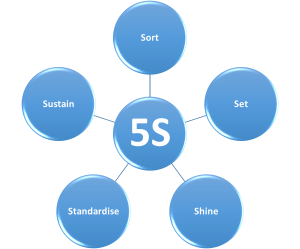 It doesn’t matter what industry or business you work in, 5S will help you if you’re struggling with – or want to improve – your organisation, productivity, focus or pace… among many other things! You can apply 5S principles to everything from manual working, to office working and even to your emails. You can apply 5S to your own individual work area and approach, or if you work in a team, you can get your team mates involved in the process to ensure everyone contributes, benefits and is signed up to a new 5S approach within your shared workspace. 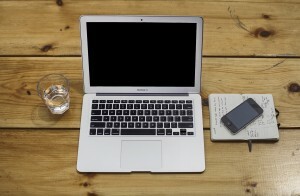 Consider how you could apply them to improve efficiency in your work space. If others are impacted (e.g. if you’re looking at a team workspace), get them involved. Get their ideas, inputs and work together as a team to identify what changes you’ll collectively make, standards you’ll sign up to and activities you’ll undertake to meet and sustain the standard. Implement your changes one S at a time. Now, go 5S that messsss and achieve survive at work success! If you want to find out more about 5S, why not check out these resources. Please note, I’m not affiliated with these in any way and cannot vouch for their accuracy.